Hedorah 6″ Bandai (2007 US Sculpt) – SKREEONK! The American Bandai Hedorah isn't as articulated as his Japanese counterpart. Ironic, much? 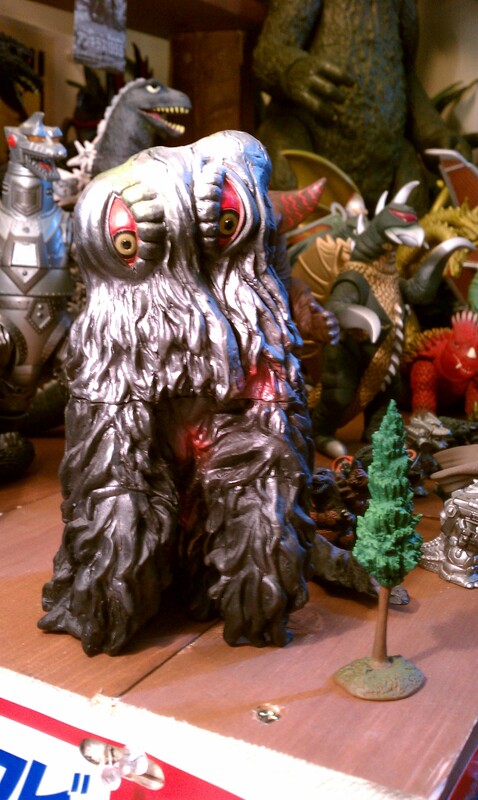 In 2007, Bandai America released another blessing among the states – a line of figures that made rarer Bandai kaiju like Destoroyah, Hedorah, and ’68 Godzilla available to us here on the other side of the world. It was a blessing indeed – I’ll never forget how excited I was when I bought six bandais at the same time in an actual store and not just online! Hedorah is, however, the most simplistic of the latest line from Bandai America – but that doesn’t stop him from being a great addition to any collector’s shelf. The sculpt is my favorite part of this figure, but I had to cut off one of the initial four stars this figure held for one reason: Look at my photo above, or any photo of this guy, and a thick “assembly” crease runs smack through the middle of this particular Smog Monster. Outside of that it’s screen accurate, and I love the overall shape of the figure. It’s very much how I always picture Hedorah – more as a mass than a humanoid. The US Hedorah has no points of articulation, though, and is more of a trophy bandai than an actual toy. The paint job is rather accurate, but isn’t detailed enough to accent the intricate sculpt. Hedorah has his metallic sheen, red/gold eyes, and blotches of sewage coloring – but thats just it, they’re blotches – random spottings of color that don’t necessarily correspond with the sculpt. Either way, he’s the right texture and coloration – and the eyes (Hedorah’s most memorable feature – besides those testicles Godzilla ripped out…) are done beautifully. That’s enough to warrant a three star paint job, right? Hedorah is readily available, and isn’t the preferred version of the newer Hedorah bandais. Most collectors go for the japanese versions’ points of articulation. I, however, prefer the sculpt of the US version. Considering that the average market price for a 6″ Bandai figure in Japan is $10 USD, it makes sense that the US 6″ Bandais sold in most toy stores here in the states for $8.99 to $10.99. Now that these toys are no longer available on the shelf in most areas, they’re being sold online for around the same price. With shipping, you should definitely be paying less than $20 for this bandai – I’d shoot for around $15 total. To me, yes. For most collectors – I’d recommend the Japanese counterpart. For the same price, it’s a better figure. Skreeonk.com gives the US 6″ Hedorah Two Stars total. Despite my personal liking of the figure, it isn’t anything special once the rest of Bandai’s beauties are considered.